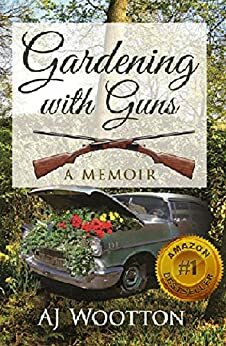 GARDENING WITH GUNS by AJ WOOTTON is a memoir which delves into the relationship between the author’s rocky childhood and her present-day struggles. We meet Amber as she gets a great job and goes on vacation with her family. Things take a quick turn for the worse when Amber’s beloved father’s body is found–suicide. While dealing with this significant blow, Amber ponders traumas from her childhood, compares her relationships with her absent father and abusive stepfather, and parses out her many tumultuous relationships—all while wondering if her past might dictate her future, knowing that her spousal relationship is also on the rocks. Although this is billed as a memoir, I’d say it reads more as a memoir-within-a-memoir, with the loose threads of the current day events—the death of a family member, followed by the arrangements for the funeral and resulting small family dramas—connecting the real meat of this book: the author’s deep dive into scenes from her childhood, some of which have had effects on her she has yet to realize. The prose reads like a stream of consciousness, which is sometimes an asset: it does make you feel like you are sitting inside the author’s head, listening to her own thoughts as she notices details and pulls apart her memories. The book does a good job of delving into the complexity of dark human drama—divorce, infidelity, suicide, abuse—while giving front stage to the inner motivations which drive our actions. The first few chapters feel like a cozy memoir, as the author chummily guides you through interviews and family vacations as one would a close friend. While some of her stories tend to ramble a bit, the author provides such detail in her work that it is impossible to get lost amidst the narratives. The importance of every scene included may be questionable, as it occasionally veers into redundancy; and the timelines can be confusing, as in at least one case we learn to live with a character and then, later on in the narrative, “meet” him. However, it falls together as a deeply-felt memoir; it is impossible to read this without feeling one knows the author extremely intimately. As the author weaves through her life as an abused child, an entrepreneurial tween, a self-conscious teenager and beyond, it’s clear that the heart of the story is the author’s relationships: those with her father, step-father, mother, siblings, friends, husband, and, ultimately, herself. Posted on January 31, 2019, in Book Reviews, Three Stars and tagged A Guardian Falls, abuse, alibris, author, author life, authors, barnes and noble, biography, book, book club, book geek, book lover, bookaholic, bookbaby, bookblogger, bookbub, bookhaul, bookhub, bookish, bookreads, books of instagram, booksbooksbooks, bookshelf, bookstagram, bookstagramer, bookwitty, bookworks, bookworm, divorce, drama, ebook, family, father, GARDENING WITH GUNS, goodreads, ilovebooks, indiebooks, infidelity, kindle, kobo, literature, memoir, mother, nook, novel, publishing, read, reader, reading, relationship, shelfari, smashwords, story, suicide, wootton, writer, writer community, writing. Bookmark the permalink. Leave a comment.